These three aspects (Lasik, Lasek, and CATz) end up being one of the most viable options for correcting refractive errors such as myopia, hyperopia, and/or astigmatism. Let us take a close look at each of them. Since 1991 this type of eye surgery has been practiced around the country, however, it is based on other procedures that date back more than 50 years. Yaldo Eye Center has been offering Lasik eye surgery in Michigan for over 20 years. The aim is to eliminate part of the cornea to correct refraction defects, and that in turn, the patient can achieve 20/20 vision or better. The treatment is quick and painless. This technique is possible thanks to the development of the Excimer Laser, which is capable of extracting tissue with high precision and without damaging other neighboring cells. It is important to know that it is the same Excimer laser that is used in other techniques that address the surface of the cornea such as PRK and Lasek. The surgery, despite being quite old, is very safe compared to other medical procedures. The risks have been diminished with time and this technique has become the gold standard for refractive surgery. However, although it is a great treatment, it cannot be used on everyone. Only those over 18 years old with stabilized refractive error, and those under 40-45 years old, who are beginning to experience presbyopia, are candidates for Lasik. In addition, if the patient has any type of eye disease such as glaucoma, this should be treated before attempting Lasik surgery. Lasik is not painful, no matter how severe the degree of refractive error one has. Some people claim to have a bit of discomfort; however, no laser-related damage causes this symptom. It is important that, in order to qualify for this procedure, your degree of refractive error must be completely stable. If your dioptres have increased within the last year, you may not yet be a candidate for Lasik, as your condition may continue to increase even though it has been temporarily corrected. This surgery is a technical variant of Lasik, it is an innovative and novel procedure invented by Japanese scientists and brought to the state of Michigan by Dr. Yaldo in 2014. 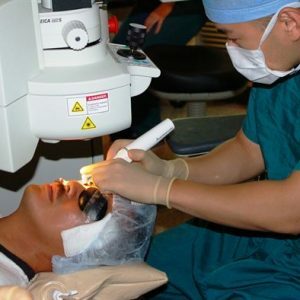 When it comes to modernized techniques, there is no Lasik technique more advanced than CATz Lasik. Thanks to this advanced technology, which uses topographical maps to treat the cornea, your Michigan or Toledo Lasik surgeon can view each of the existing imperfections in your cornea and effectively correct them. Incredibly, some patients vision improves beyond “20/20” to 20/15 or even 20/13. All thanks to the creation of the topographic map of the cornea and the joint use of Lasik. This is the acronym for Light amplification by stimulated emission of radiation, an eye surgery that arose around 1999, long after LASIK. In this case, the essence of the technique is to reshape the corneal tissue by creating a flap with the corneal epithelium. The outer edge of your cornea, the circular rim in the center of your eye, must be removed so that the laser can reduce the thickness of your cornea and thus correct the refractive error. In this case, topical anesthesia is used and an alcohol solution is added to the cornea to soften the upper tissue. The process does not take long, perhaps 5-10 minutes depending on the surgeon. Not everyone can undergo Lasik, not only because of the age requirement but also because of the degree of refractive error required to be a candidate for Lasik Grand Rapids. On the other hand, it can treat refractive error in patients with corneas too thin for Lasik, even for corneas that have scars from previous processes or eyes that have suffered from glaucoma. It causes some pain after surgery and the recovery period may be longer than Lasik. It is important to mention that often these types of corrections are useful in athletes who practice high impact sports. The post Lasik, Lasek, and CATz; What’s The Best Form Of Lasik In 2019? appeared first on Top Michigan Lasik Eye Surgery | Yaldo Eye Center | (248) 553-9800.